This is a CD I've been listening to for some time now before actually writing the review on it. This is also a situation where the CD took a few spins to grow on me, so I am very fortunate to have waited to write the review. Sometimes an album strikes me as great or poor after just the first spin. At first, I thought this album was just another mediocre power metal album and probably would have quoted it around a 70 at the time. Well, I'm glad that I have let this album absorb a little bit more because this is actually a good album that deserves the attention of power metal fans out there. 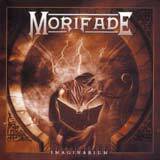 Morifade is a six piece playing power metal enriched (not drowned) with keyboard textures resulting in a very uplifting delivery. With the opening track Lost Within a Shade, the soaring vocals reminded me immediately of Harry Conklin of Jag Panzer. When I hit the slower, but incredibly emotional and melodic Nevermore, flashes of Jeff Scott Soto came to mind. While I can't say that the vocals of Morifade match or surpass either Conklin or Soto, I can say that Morifade features a dynamic vocalist that certainly adds emotion to each song. My next compliment has to go to the rhythm section. The bass level is just right and gives the overall a full sound while providing a solid backbone to the lightning fast double bass and speedy riff work that dominates the album. The drum work itself very fast, yet tight and precise. I am impressed with the technical capabilities displayed on the drum set as you won't find a monotonous or boring drum beat on the album. While I enjoy the outstanding, lightning fast riffs found on this album, by the time you reach the second half of the disc you may feel as if you've heard the same riff earlier in an earlier track. This doesn't happen frequently enough to ruin the album, but I did begin to notice this after several listens to the album. Of course, when the riffs are as good as they are, this is really only a minor complaint. Another point regarding the guitar work, the dual guitar work sprinkled throughout the album is excellent and combine with the keyboardist to give the songs nice depth. Imaginarium is also chalked full of catchy melodies which honestly will take a few listens to fully absorb. Strong melodies are a quality I look for in my music, and since the melodies here did take a while to sink in, that seems to explain why this album slowly, but surely has grown on me. The production is certainly adequate, although it is a little bit on the raw side at times. Bigger production (especially in bringing out the backing vocals more) would be a big step in elevating Morifade to the next level. All in all, Imaginarium is a very good power metal album with solid musicianship. You may need to give it a few spins in order to appreciate it, but if you give it a chance, I'm think that you will be satisfied. Morifade is certainly still on the right track with this release, but they really need to step up the production with their next release in order to become a major player in the metal scene.